﻿ NPP AKKUYU NÜKLEER A.Ş. The Akkuyu NPP project will have 4 power units with capacity of 1200 MW each. Akkuyu NPP is an NPP-2006 serial project based on the Novovoronezh NPP-2 (Russia, Voronezh region). The service life of Akkuyu NPP is 60 years. Slightly enriched uranium dioxide serves as the fuel. 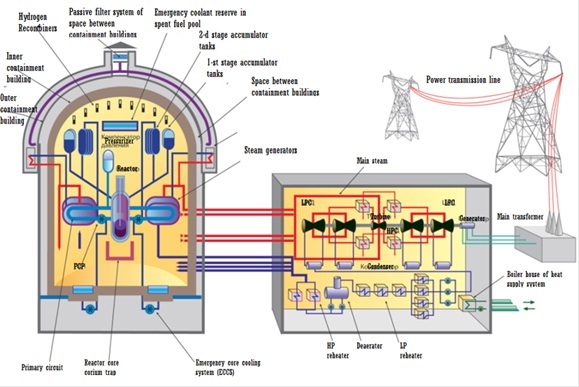 The power unit includes a reactor plant and a turbine plant. The primary circuit is radioactive. It consists of a reactor, four reactor coolant loops, four reactor coolant pumps, heating parts of four steam generators and one steam pressurizer. The secondary circuit is not radioactive. It consists of steam generating part of steam generators, fresh steam conduits, one turbine unit comprising of a turbine plant and a turbine generator, condensate pumps, system of low-pressure regenerative heaters, turbine condensate system, deaerators, feedwater system, including feedwater pumps and system of high-pressure regenerative heaters. The turbine is equipped with condensing unit, regenerative installation for heating of feed water, separators - steam superheaters, there are unregulated steam extraction for the NPP auxiliary needs and for heating of chemically treated water additives in the circuit. The power unit is equipped with safety systems designed to prevent design basis accidents and/or limit effects thereof.